The Hypothekers Association (DHA) is a franchise organisation with more than 170 branches. These locations are known under the name De Hypotheker. The offices give independent advice about the available mortgage forms and the related insurance policies. After consultation, they take care of the quotation and closing of the mortgage. The organisation plays a leading role in the mortgage market. From the central organisation in Rotterdam, the administration, coordination and support of all branches take place by a team of more than 150 employees. 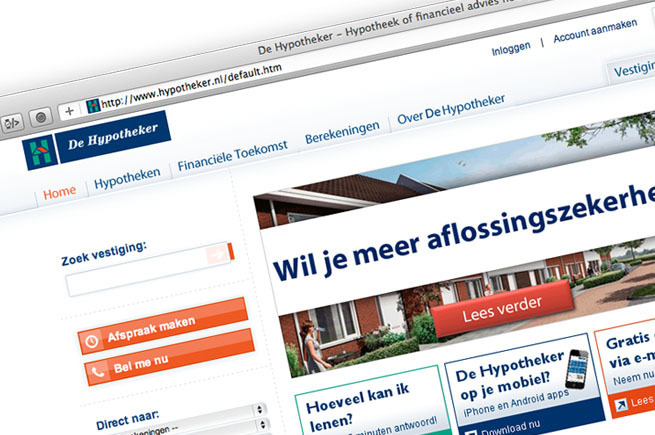 De Hypotheker signals changing communication needs due to the changing times in the mortgage market. Every branch needs to be able to respond to current events quickly. Moreover, communication must be as efficient as possible so that De Hypotheker's proposition remains sharp. The marketing department of DHA, therefore, wanted a platform with which all wishes were fulfilled. We provided a marketing support platform for all franchisees. On the platform, all branches can compile personalised communication materials themselves, place them in the local newspapers or order them directly from the printer. These include advertisements, flyers, columns and many other expressions. It is an excellent, next step, to let our branches independently use marketing resources while taking time and cost-saving work. The platform was launched in January, and all branches were given access to their environment. Want to know more about our software? Contact us for a free demo.